A KAIST team presented a highly customizable neural stimulation method. The research team developed a technology that can print the heat pattern on a micron scale to enable the control of biological activities remotely. The research team of Professor Yoonkey Nam at the Department of Bio and Brain Engineering expects this will serve as an enabling technology for personalized precision neuromodulation therapy for patients with neurological disorders. 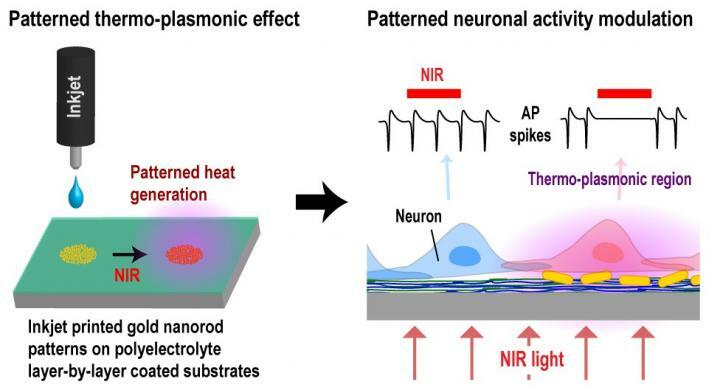 The nano-photothermal neural stimulation method uses the thermo-plasmonic effect of metal nanoparticles to modulate the activities of neuronal networks. With the thermo-plasmonic effect, metal nanoparticles can absorb specific wavelength of illuminated light to efficiently generate localized heat. The research team discovered the inhibitory behavior of spontaneous activities of neurons upon photothermal stimulation four years ago. Since then, they have developed this technology to control hyperactive behaviors of neurons and neural circuits, which is often found in neurological disorders such as epilepsy. In order to overcome the limitation on the spatial selectivity and resolution of the previously developed nano-photothermal method, the team adopted an inkjet printing technology to micro pattern the plasmonic nanoparticles (a few tens of microns), and successfully demonstrated that the nano-photothermal stimulation can be selectively applied according to the printed patterns. The researchers applied a polyelectrolyte layer-by-layer coating method to printing substrates in a way to improve the pattern fidelity and achieve the uniform assembly of nanoparticles. The electrostatic attraction between the printed nanoparticles and the coated printing substrate also helped the stability of the attached nanoparticles. Because the polyelectrolyte coating is biocompatible, biological experiments including cell culture are possible with the technology developed in this work. Using printed gold nanorod particles in a few tens of microns resolution over a several centimeters area, the researchers showed that highly complex heat patterns can be precisely formed upon light illumination according to the printing image. Lastly, the team confirmed that the printed heat patterns can selectively and instantaneously inhibit the activities of cultured hippocampal neurons upon near-infrared light illumination. Because the printing process is applicable to thin and flexible substrates, the technology can be easily applied to implantable neurological disorder treatment devices and wearable devices. By selectively applying the heat patterns to only the desired cellular areas, customized and personalized photothermal neuromodulation therapy can be applied to patients. "The fact that any desired heat patterns can be simply 'printed' anywhere broadens the applicability of this technology in many engineering fields. In bioengineering, it can be applied to neural interfaces using light and heat to modulate physiological functions. As another engineering application, for example, printed heat patterns can be used as a new concept of anti-counterfeit applications," said the principal investigator, Yoonkey Nam at KAIST. This work, led mainly by Dr. Hongki Kang, was published in ACS Nano on February 5th 2018.